At the Ultimate Panja League, four teams weighed in. Mitti ka Sher: Jassa Patti or Jaskanwar Singh Gill? It’s the night the bouncers pranced into the club and took centrestage, flexing their ripped biceps to the DJ’s house music. Men and women huddled around a table as their Hulken peers jostled to make a pin — all the while being careful not to raise their elbow off a cushion. 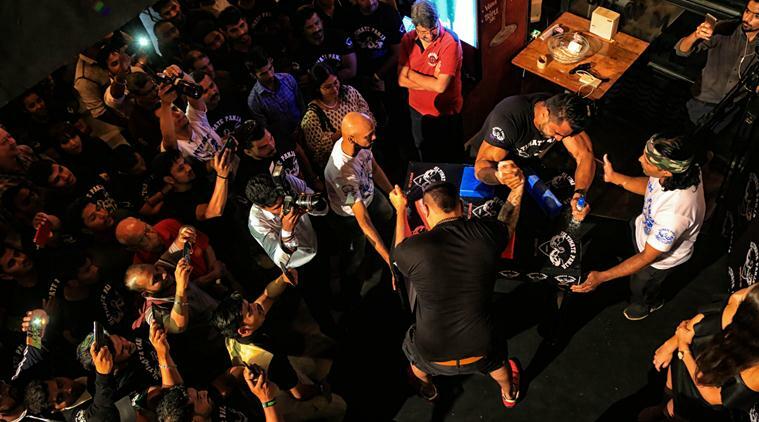 It was the first edition of the Ultimate Panja League, held in an upscale Mumbai bar. A battalion of “arm-wrestlers”, each with bulging biceps and broad shoulders, had strolled onto the floor. Jaws dropped, and then the guests scurried for cover, lest they be caught in that “march” to the stage. 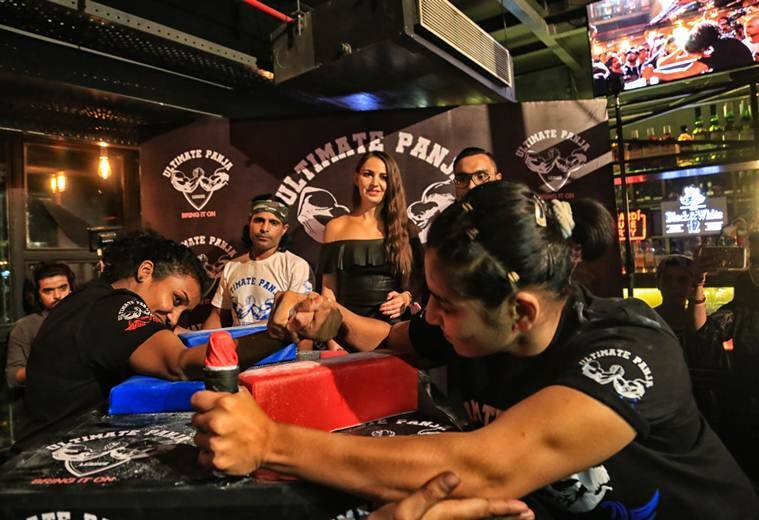 “Arm wrestling competitions are usually held in small rooms or at most in a gymkhana, so no one expects an atmosphere like this,” says Prashant Kumar, founder of the Ultimate Panja League. “I wanted to just make it fun because we need to attract an audience,” says Kumar, who has previously dabbled in mixed martial arts. Soon, television screens beamed the bouts with four franchise teams, comprising six members, including women, in action — the Punjabi Panjas, Haryanvi Panjas, Mumbai Panjas and Pune Panjas. All of this wasn’t particularly new for Kushnoor Jijina, captain of the Mumbai Panjas, who has worked as gym-trainer to corporate leaders and children of top south Mumbai business families, as well as actors Ranbir Kapoor and Riteish Deshmukh. He has to his credit a choreography sequence with Kapoor in Roy (2015), but he grew up crunching radius-ulna bones on the pivot of an elbow in arm-wrestling. Like the front-runners that they were when cricket took off in Mumbai, the Parsi community enjoys a long tradition of arm-wrestling at the various gymkhanas. Kushnoor’s debut is being keenly followed by friends who are looking forward to the next edition — when they can step into the ring. “They are very happy to hear this because we Parsis have our own events, so everyone is really happy that this league is coming. They are eager to compete,” he said. The impromptu palm-offs have never failed to attract a crowd at Parsi gatherings, with loud, snarky sledging never too far. As a sport, arm wrestling’s mainstream popularity is geared towards the differently abled community pushing it for inclusion in the paralympics. With affiliation from the International Arm Wrestling Federation, the league is looking to bring in foreign arm wrestlers and pit them against Indians. The current players were scouted by Kumar through former contacts in the mixed martial arts circuit — the four women in the fray were boxers. Hashpreet Singh, captain of Punjabi Panjas, is a 21-year-old Pune-resident currently pursuing a degree in computer engineering. Writing code, though, is strictly a back-up. His main goal is to get into professional fitness training. The target, he maintains, “is to become a celebrity trainer, or even work with athletes.” He had attended the Mr Olympia competition in 2017 as a spectator, and in one of the booths at the fan park, he competed in an exhibition arm wrestling competition and won nine bouts in a row. “I certainly got to show off after that,” he says. “You can tell a lot about how things will go just by the handshake,” Hashpreet explains. “You can tell from the grip if you have a strong chance against the opponent. So, in a way, the handshake can be intimidating.” He should know: he went on to win the first ever bout of the UPL. But it was an ominous warning for spectators not to offer a handshake — not in congratulations nor in greeting. It’s a slow start for a sport “everybody” has heard of. The plan ahead is to organise the league once a month at bars, before moving to colleges around the city.